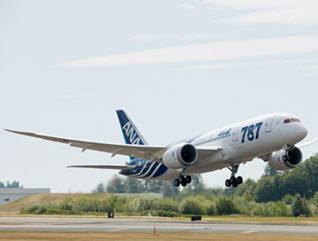 September 25, 2011 - Boeing and ANA Airlines have signed the formal documents completing the contractual delivery of the first 787 Dreamliner. Celebrations to mark this historic milestone begin tomorrow in Everett with a delivery ceremony followed by flyaway of the airplane on Tuesday. Today's signing comes after a series of flights, inspections and the transfer of funds. "Now that the airplane is ready to deliver, the entire team is ready to celebrate," said Scott Fancher, vice president and general manager of the 787 program. "We look forward to honoring our launch customer ANA before they fly their first Dreamliner home to Japan." Celebrations for Boeing employees begin Monday at 6 a.m. (Pacific time) outside the 787 factory in Everett with the static display of ZA002, one of the flight test airplanes painted in ANA's livery. ANA and Boeing executives, employees, partners and government officials will gather at 9 a.m. for the delivery ceremony in the same location. Airplane 24, painted in ANA's special livery, will join the display during the ceremony. Flyaway of the airplane to Tokyo is scheduled Tuesday morning at 6:35 a.m. from Paine Field. A live webcast of Monday's delivery events and Tuesday's flyaway can be seen. Video highlights of those events also will be posted to the website. "ANA has been a tremendous partner from day one," said Fancher. "Through the hard work and challenges, the Boeing team never lost focus on the commitments to our valued customer. We know ANA's customers will love this airplane." All Nippon Airways also known as Zennikkū or ANA, is one of the largest airlines in Japan. It is headquartered at the Shiodome City Center in the Shiodome area in Minato, Tokyo, Japan. It operates services to 49 destinations in Japan and 35 international routes and employed over 14,000 employees as of May 2009. In May 2010, ANA's total passenger traffic is up year-on-year by 7.8%, and its international services grow by 22% to 2.07 million passengers in the first five months of 2010. ANA's main international hubs are at Narita International Airport outside Tokyo and Kansai International Airport in Osaka. Its main domestic hubs are at Tokyo International Airport, Osaka International Airport, Chūbu Centrair International Airport (near Nagoya), and New Chitose Airport (near Sapporo). In addition to its mainline operations, ANA controls several subsidiary passenger carriers, including its regional airline, Air Nippon, charter carrier, Air Japan, and Air Next, a low-cost carrier based at Fukuoka Airport which handles flights for ANA. Additional smaller carriers include Air Nippon Network (A-net), a subsidiary of Air Nippon, Air Central, Q400-based airline based at Chūbu Centrair International Airport, and ANA & JP Express (AJV), a freighter operator. ANA is also the largest shareholder in Peach, a low-cost carrier which plans to begin operations in 2012. All Nippon Airways is currently an official sponsor of Japan Football Association. US Airways Operates 200th World War II Veterans Flight To D.C.